Technology changes rapidly, and tablets are becoming not only more sophisticated, but also more ubiquitous and affordable. Hospital Owned Tablets can be a great investment. Patients can access entertainment, meals, assistance, education, sound therapy, pain management and communication right from their bed. The Talon's unobtrusive mounting system makes it easy to mount right onto the bed rails, stretchers, IV poles, wheelchairs, as well as wall arms. 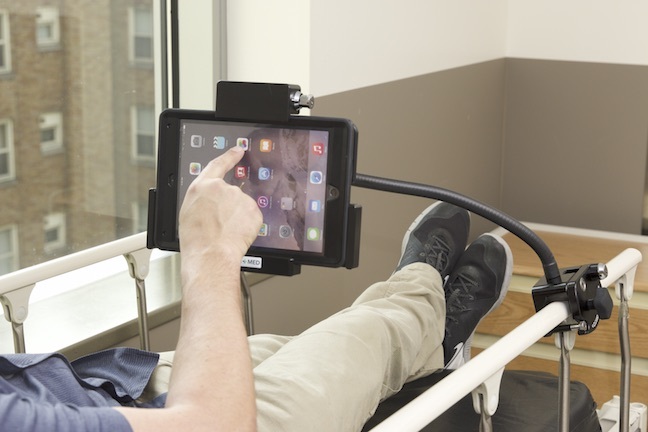 It is lockable, durable, cleanable, and also offers the option of locking the tablet in place, or providing a mount for patients who want to bring their own device. A tablet can help track and assist with a patient's stay from admission to discharge. The multi-faceted functionality makes it one of the most useful tools a hospital could implement for greater patient satisfaction, which ultimately results in better HCAHPS scores. This includes everything from patient orientation upon admission, to video monitoring, room control, entertainment, and education. The tablet can be the ultimate resource for the entire patient stay, from admission to discharge. All Talons come with a five year warranty.